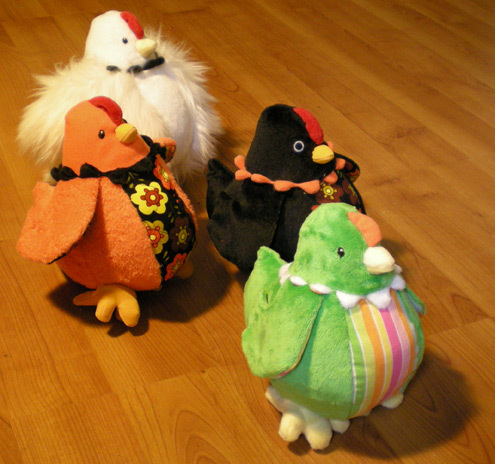 The second plush pattern I made is a chicken. I grew up with chickens so for the most part I think they're cute, but Alec really loves them. Perhaps because he has never seen them tear apart a centipede and gobble it up like it's the most delicious treat they've ever had. 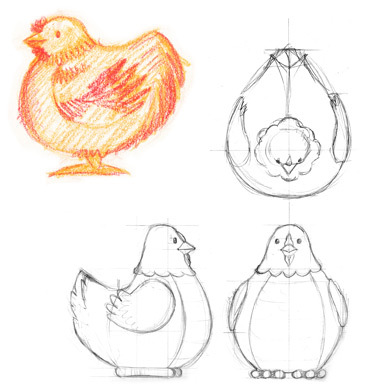 In my sketches for the hen I drew the wattle, but discarded it in the pattern process to make it cuter, just keeping the comb. 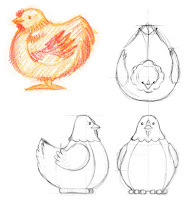 The feet were the trickiest part, I made them big to make assembly a little easier but it was still difficult getting them to stay close to the body without the hen rolling over. One of the best things about a plush chicken is that they can be made is all sorts of colors and textures and you still know that it's a chicken. Then again I'll probably say that about anything, I just like bright colors reality notwithstanding.